While the actual idea of creating astro-maps is relatively new, the theory upon which the maps are based is really quite old. Since time immemorial, astrologers have placed great significance on the rising and setting of the planets, believing that when planets are on these “angles,” their influence is most powerful. In addition to the angles of rising and setting, astrologers also look at what planets may be culminating or at the highest point in the sky and its opposite point of anti-culmination. The most easily understandable illustration is the movement of the Sun from sunrise (rising or ascending, representing the self) to high noon (culmination, signifying one’s highest aspirations or career) to sunset (setting or descending, corresponding to others) and, finally, to midnight (anti-culmination, symbolizing one’s home and roots). In calculating a chart, the astrologer uses the date, time and place of birth to find out exactly what degrees of the zodiac were on these angles and examines the chart to find out if any planets are near those angles. But, astro-mapping takes place out of the equation. Here, lines are drawn on a map of the world showing exactly where, at that precise moment in time, the planets are on their four angles. So, while the sun may be rising in New York City, it is culminating in Prague, setting in Jakarta and at its lowest point or anticulmination on the Alaskan Peninsula. Jim Lewis, as well as the handful of other astrologers to first use this technique, plotted the lines on the map by hand, a painstaking process to say the least. 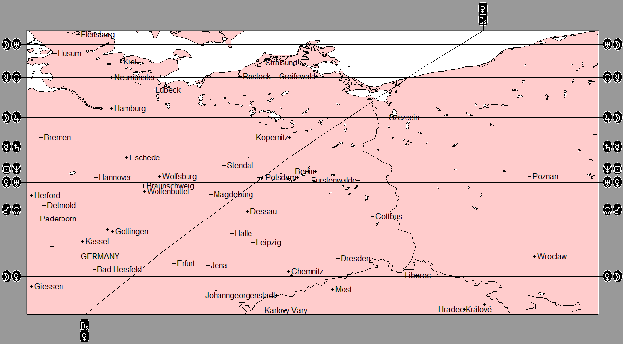 Thanks to computer programs like Solar Maps, a map with such lines can be drawn in a matter of seconds, another reason why this technique came to popularity in our modern world. Two bodies rising together (conjunct the oblique Ascendant). One rises while the other sets (oblique Ascendant opposition the oblique Descendant). One rises, the other culminates or anti-culminates (oblique Ascendant square right ascension). Two bodies set together (conjunct the oblique Descendant). One body sets, the other culminates or anti-culminates (oblique Descendant square right ascension). Two bodies culminate or anti-culminate together (conjunct the right ascension). One culminates while the other anti-culminates (right ascension opposition right ascension). 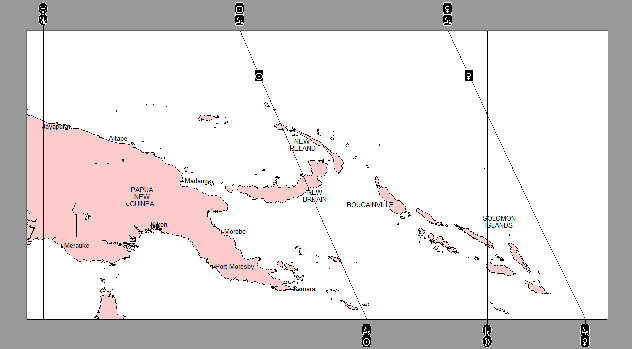 Parans (except for types 2 and 7) are easily seen on the map as line crossings. 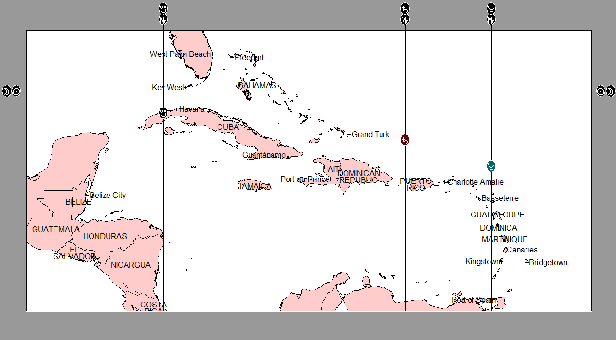 Except for types 6 and 7, parans are latitude-specific. Jim Lewis believed that places along the latitude, regardless of longitude, would all be sensitive to the energies of the planets that comprise that particular paran. This is because as the earth revolves over the course of the day, the paran will occur at some point at each place along that latitude line. Every place along that latitude is sensitized to the energies of the planets involved, even though the crossing occurs in only one place. John F. Kennedy’s astro-mapping is a fascinating example of the power of astro-locality techniques. Let’s look at one of the very first places in the world that brought Kennedy to fame – the location in the South Pacific where the patrol torpedo boat he commanded, the PT-109, sank during World War II. A few of the crew members perished, and Kennedy, who sustained a chronic back injury, managed to save the life of one of his crew members, towing the man several miles to shore by holding the strap of the fellow’s life jacket in his teeth. 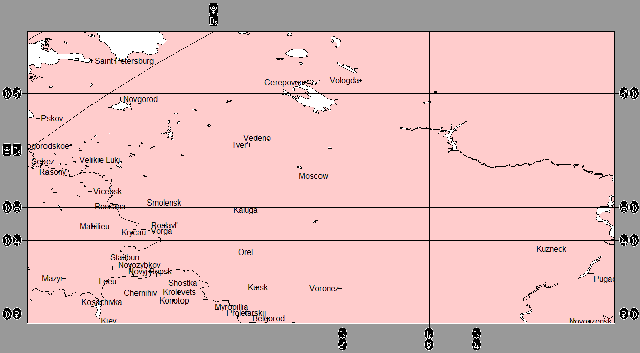 The location of this event, quite close to Gizo, Solomon Islands, is under the influence of three planetary lines: the Sun and Venus rising line, and the Moon at anti-culmination. The Sun represents the hero in us all, and places where the Sun rises afford an opportunity to shine. Certainly Kennedy acted bravely, and the situation truly brought out the best in him. Since the Sun rules the 11th house in Kennedy’s natal chart, it makes sense that he would risk life and limb for his comrades. And, with Venus rising nearby as well, the incident ultimately buoyed Kennedy’s popularity with the electorate that would soon send him to the House, Senate and, ultimately, the Presidency. And with the Moon (ruler of the natal 10th house) at anticulmination (representing one’s nurturing and traditions), it is likely that Kennedy’s upbringing played a part in the extraordinary effort Kennedy made to save his shipmate. Interestingly enough, Kennedy gained even more fame as a result of the incident. While he was recuperating from back surgery necessitated by the injuries he sustained on PT-109, he penned the 1957 Pulitzer Prize-winning Profiles in Courage, a book about two Senators who risked their careers to do what they believed to be right. Though he was only President for a thousand days, there are certain places in the world that are forever identified with Kennedy. One is Berlin, where Kennedy showed solidarity with the citizens of the city that found itself divided by the Berlin wall. It was there that he uttered the famous words, “Ich bin ein Berliner.” While the Cold War sizzled, Kennedy’s Venus setting line in Berlin ensured that he would be much loved by the people of West Berlin. 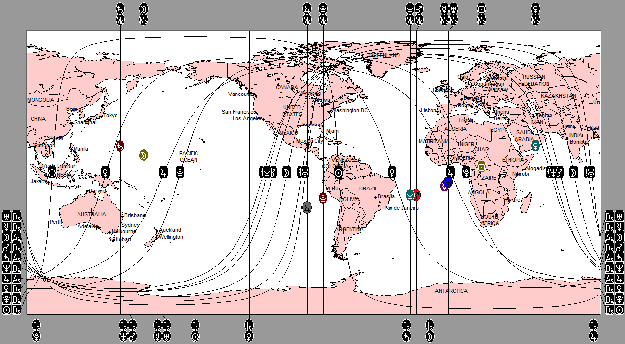 Three paran or crossing lines are within a 15 minute orb of Berlin’s latitude as well: Venus/Uranus, Sun/Neptune and Mars/Node. These planetary energies are indicative of sudden popularity, an idealistic vision and a call to work together. 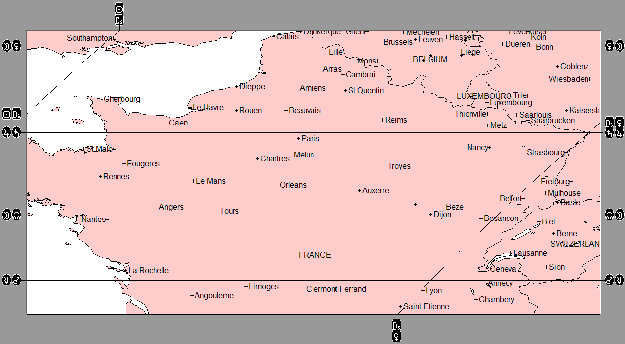 Looking at France, we see that Kennedy’s Sun and Venus set lines are about 260 miles west and east of Paris respectively, with their midpoint passing exactly through the city. Kennedy famously quipped that he was the man who accompanied Jacqueline Kennedy to Paris. And looking at Russia, we see that Mars, the planet of war, is at its low point in Moscow, the seat of Nikita Khrushchev’s Russian government. With this placement, Kennedy saw Russia and Communism as a threat to his heritage as an American. After all, Khrushchev did vow to “bury” democracy. But it would be in Cuba where the real battle between Kennedy and Khrushchev would be fought during the Cuban missile crisis. At the western end of Cuba, we find the Moon’s South Node, a point of karma, culminating, suggesting that Kennedy’s Presidency would be inextricably connected to this place. East of Cuba but still within orb, Saturn, the planet of leadership and discipline, is also culminating, indicating that he could draw upon Saturn’s gifts of discipline and authority. Certainly, Kennedy’s diplomatic and cool-headed handling of the crisis averted what could have easily become World War III. And at the same time, he safeguarded the Western Hemisphere from the constant threat of Soviet attack. 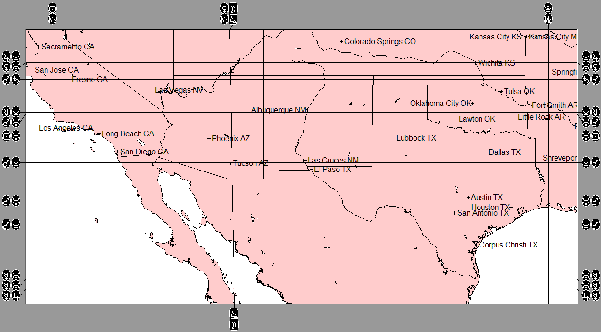 Kennedy’s quest for the Presidency began with his winning the Democratic nomination in Los Angeles, a location that, as shown by the map below, lies just east of his Sun culmination line. Here, the hero achieves his career aspirations. In Kennedy’s case, he additionally realizes the goals set for him by his father, who is also represented by the Sun. Perhaps there is no place more associated with John Kennedy than Dallas, the city where he was assassinated. As you will see from right-hand side of the above map, this is within orb of the line where Pluto, the planet of power, transformation and death, culminates. Dallas’ latitude is also in orb of the parans of Mars/Neptune and Sun/Uranus. Kennedy’s death not only ended his Presidency but it also began his legacy as the much-loved, martyred President. All illustrations are from Solar Maps, version 3.